On April 25, the Okinawa Prefectural Government (OPG) announced that compared to fiscal year (FY) 2016, FY 2017 saw a 9.2% increase in incoming tourists, or 809,800 more people, for a record high of 9,579,000. There were several factors that contributed to this overall increase. First, there was an expansion of domestic air routes, such as direct flights to and from remote islands. Secondly, there were more foreign tourists due to increased foreign air routes. Lastly, the number of times cruise ships stopped at ports increased. For FY 2018, the OPG aims to achieve 10 million tourists or a 4.4% increase compared to FY 2017. The OPG plans to reinforce their strategies for attracting tourists and receiving them. The breakdown of FY 2017’s tourists were: 6,887,000 domestic tourists (+3.7% compared to the previous year) and 2,692,000 foreign tourists (+26.4%). All months in FY 2017 had surpassed its numbers from the previous year. In August, for the first time ever, the number of tourists reached one million in a single month. Breaking down the foreign tourists by location, 813,000 (+24.7%) were from Taiwan, 546,000 (+25.4%) were from mainland China, and 544,800 (+20.5%) were from Korea. The increase in mainland Chinese tourists was a result of an increase in the number of times a cruise ship stopped at ports. 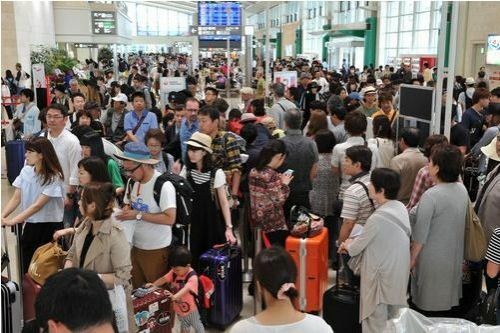 The increase in Korean tourists was due to the newly established Daegu air route. The year-round flights to and from Bangkok and new Singapore routes also supported the overall increase. The goal of reaching 10 million tourists in FY 2018 is a year ahead of schedule compared to the Fifth Prefectural Tourism Development Basic Plan. The plan had already been adjusted upward last year. On April 25, Lieutenant Governor Moritake Tomikawa held a press conference at the prefectural office.